Air Central origins were found in the Taupo Flying School which was established by Peter Matich in partnership with the Auckland Flying School in December 1966. It expanded its operations by obtaining an air charter and air taxi licence in September 1968 using a variety of single-engined aircraft. 1971 was a significant month in the Taupo Flying School’s development with the Napier Aero Club contracting the company to provide aircraft and flying staff in April while the following month the company acquired its first twin-engined aircraft, Cessna 337 ZK-DAQ. In late 1971 John Gardiner took a shareholding in the company and he was to have a significant influence on the company’s evolution. The company continued to expand with the establishment of a maintenance base at Taupo in 1972. 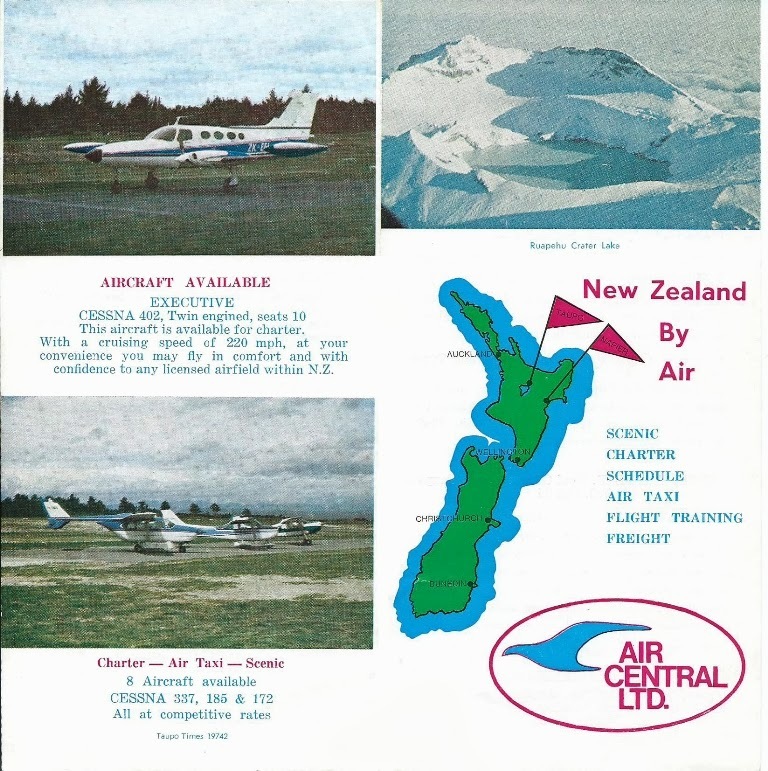 In October 1973 the company began air taxi services between Napier and Gisborne using Cessna 172s. 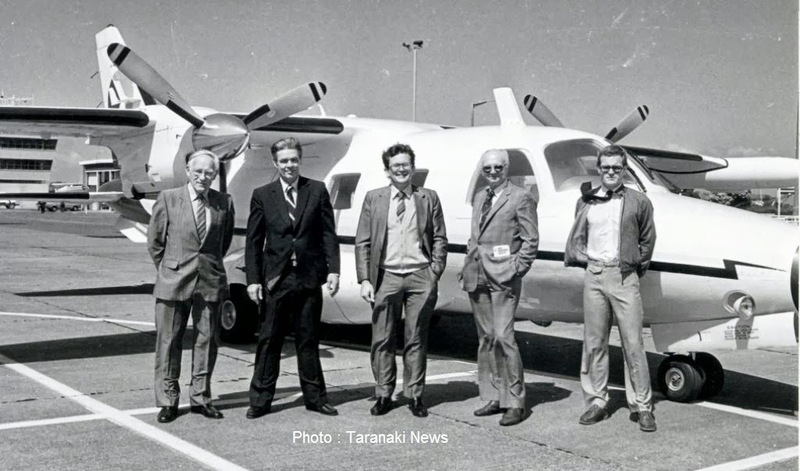 In his book, Heartland High Flier, Bruce Gavin records that, The early morning flights carried Hawke’s Bay business people wanting to do a day’s work in Gisborne. The aircraft and pilot usually waited in Gisborne all day before returning to Napier in the late afternoon. Later the larger twin engine Cessna 337s were used, in part to overcome a reluctance some passengers held about flying in a single engine aircraft. The charter operations traded under the names Taupo Air Services and Napier Air Services. A second Cessna 337 Skymaster, ZK-DFT, was added to the fleet in January 1974. 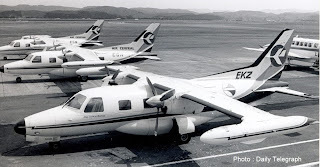 One of the Cessna 337s was based at Taupo while the other was based at Napier. Later in the year the company was granted permission to offer IFR air charter work. Paul Wright, who was to be Eagle Air’s first pilot for their airline division, was appointed as pilot. The push-pull engine configuration of the Cessna 337 did not garner much public support so in late 1974 the company evaluated a Cessna 402, ZK-DHW before purchasing their own Cessna 402B, ZK-EEI in mid-1975. Slightly prior to this Jim Ellingham was taken on as another partner in the business. The arrival of the Cessna 402 coincided with NAC reviewing its inter-provincial air services. 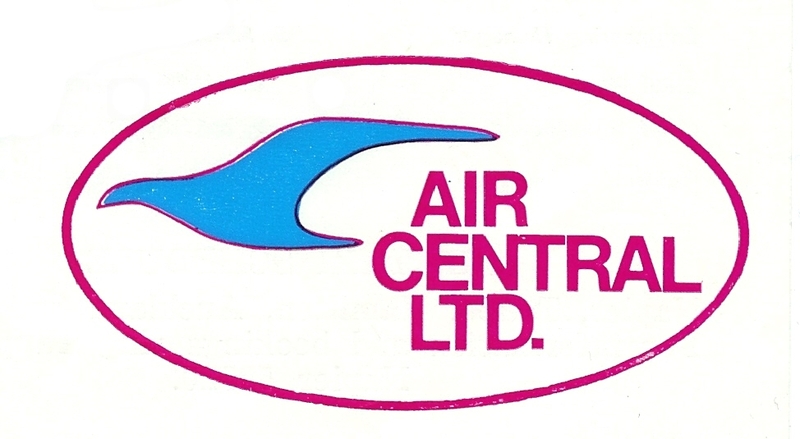 Seeing the need for a more corporate image the company was renamed Air Central. John Gardiner managed the Napier operation and it was he who was to develop the air taxi and later scheduled operation. 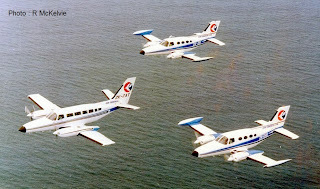 In October 1975 the Cessna 402 was used to commence an air taxi service from Napier and Taupo to Auckland. Initially this was flown twice a week but it was later expanded to four days a week and then five days a week with Hamilton being included. 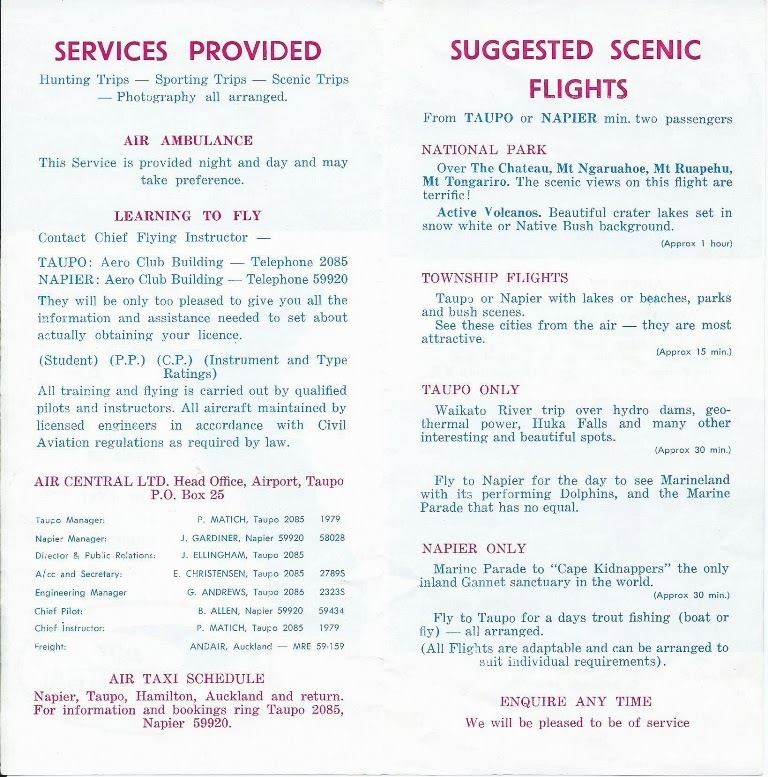 The air taxi regulations stipulated that before the air taxi service could operate there had to be passengers from Napier or Taupo; in other words the plane could not fly empty northbound. Passengers could be set down at Hamilton on the northbound journey to Auckland, but passengers could not be picked up there. On the afternoon service the company was only able to uplift those passengers from Hamilton that it had flown north. With McKay Shipping taking a stake in the company, a second Cessna 402B, ZK-EHS, was purchased in August 1976. 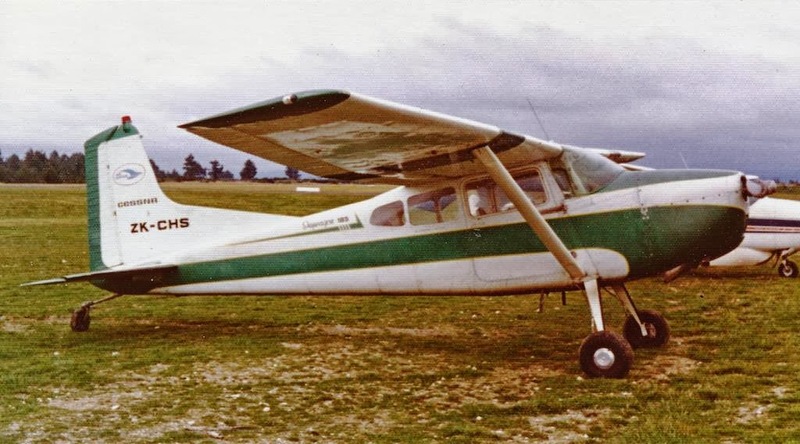 In September this was used on a weekly Taupo-Wellington air taxi service but in the few weeks it operated passenger loadings only averaged two to three. The company, looking for a greater return, moved the Cessna 402 to Napier and used it on the air taxi service to Gisborne. 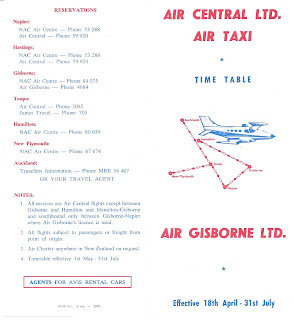 But in addition to this service the company entered into an agreement with Air Gisborne who had successfully obtained a licence for a timetabled air taxi service between Gisborne and Hamilton. 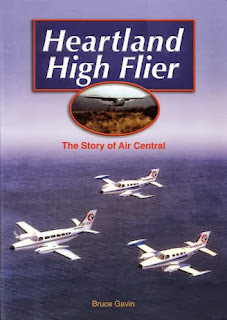 Air Gisborne had the licence and used Air Central’s Cessna 402 and pilots. Air Gisborne offered two return services on week days and one return service on Saturdays and Sundays. 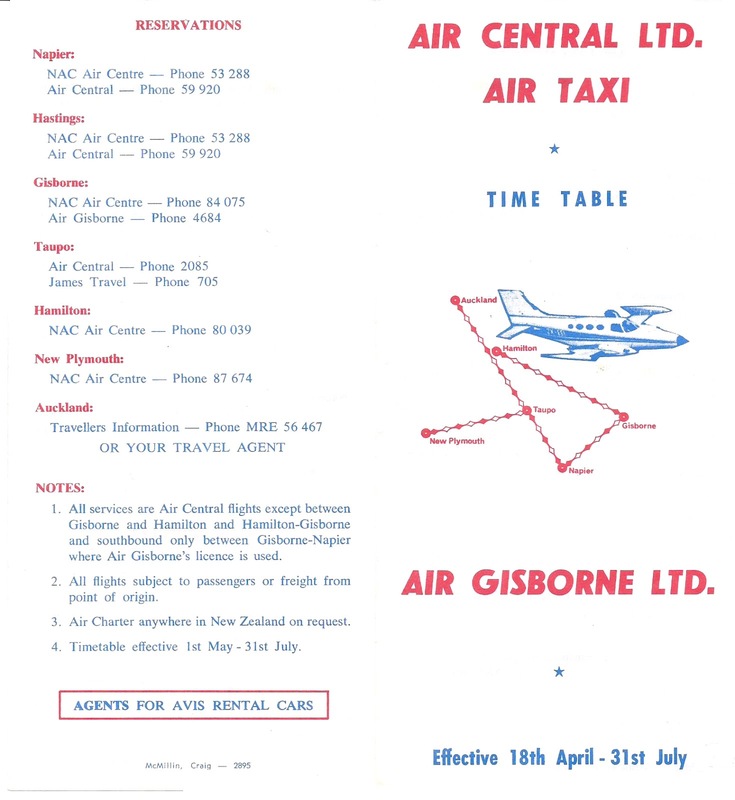 This service was in direct competition with Air North’s scheduled service and in August 1977 the Air Services Licensing Authority prevailed upon Air Gisborne and Air Central to cease the joint air taxi operations between Napier and Hamilton. 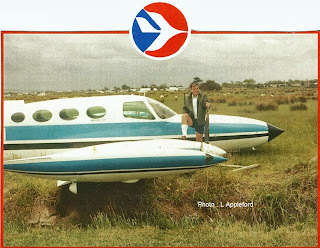 In the interim the company started a thrice-weekly Napier-Taupo-New Plymouth air taxi service in January 1977. Then, from the 1st of September 1977 Air North relinquished its Gisborne-Napier-Palmerston North service. This was the opportunity that Air Central needed and it applied to the Air Services Licensing Authority for a scheduled service between Gisborne, Napier, Palmerston North, New Plymouth and Taupo. The application was successful and the first scheduled service was flown in ZK-EEI on the 26th of September 1977. 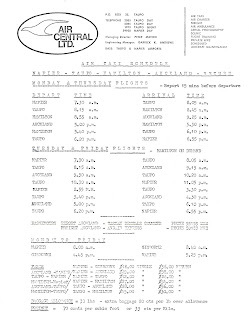 By late 1977 Air North was short of aircraft and from the 7th of December 1977, Air North entered into an agreement with Air Central to 'wet hire' one of their Cessna 402 aircraft to operate their daily return Gisborne-Hamilton service. 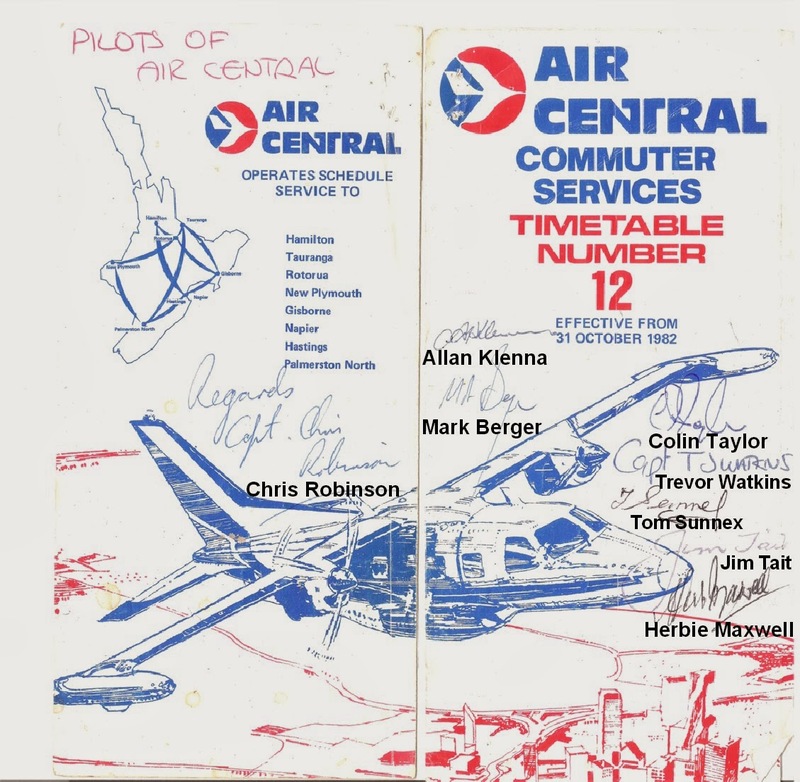 A couple of weeks later, on the 19th of December 1977, Air Central commenced a Napier-Taupo-Hamilton scheduled service in their own right. 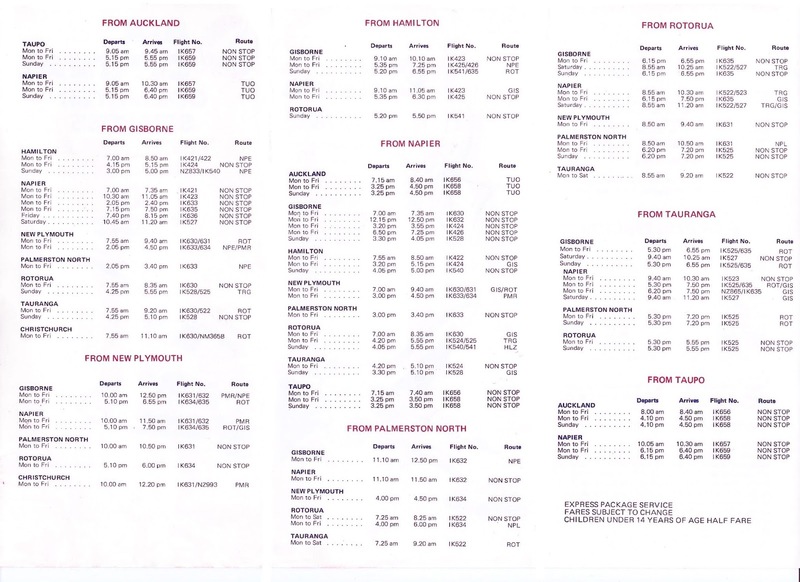 Air North’s financial state continued to worsen and when it failed to pay Air Central for the use of their Cessna 402 it applied to take over Air North’s scheduled services from Gisborne to Hamilton. The application was opposed by Air North. At the hearing on 14 and 15 March a volume of complaints were heard as to the manner in which Air North had operated its services. 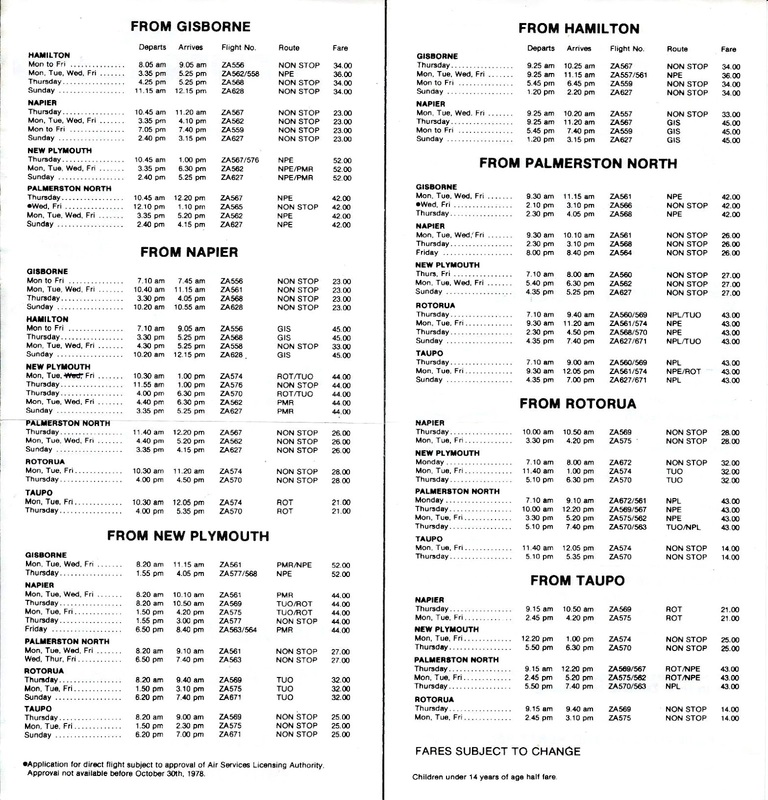 The application was successful and Air Central took over the Gisborne-Hamilton service in May 1978. 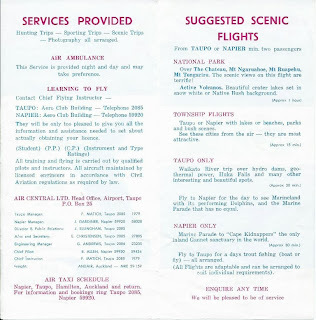 In 1978 the single engined aircraft operations at Taupo and Napier were sold and the Taupo base was closed. 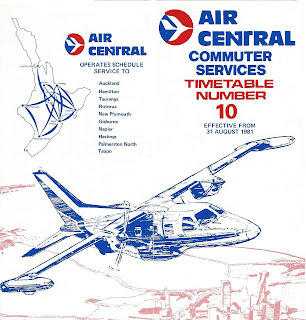 Rotorua was included in Air Central’s network from the 29th of October 1978 with flights operating New Plymouth-Rotorua-Napier. These flights were at the expense of services to Taupo which were reduced. 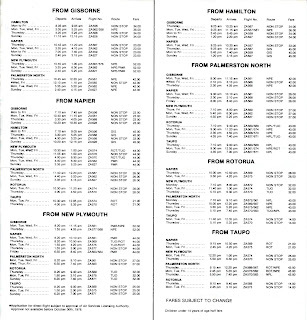 Taupo experienced further reductions to its services in June 1979 and in October 1980 the company pulled out of Taupo altogether. In May 1979 the company leased a 12-seat Cessna 404 Titan, ZK-TAT, which had been previously operated by Titan Air Services for Courier Systems. The operating costs of the larger twin were prohibitive and the aircraft returned to its owners later in the year. It was subsequently used by James Air and Avcorp Commuter. In February 1980 a third Cessna 402B, ZK-DNQ, joined the Air Central fleet. 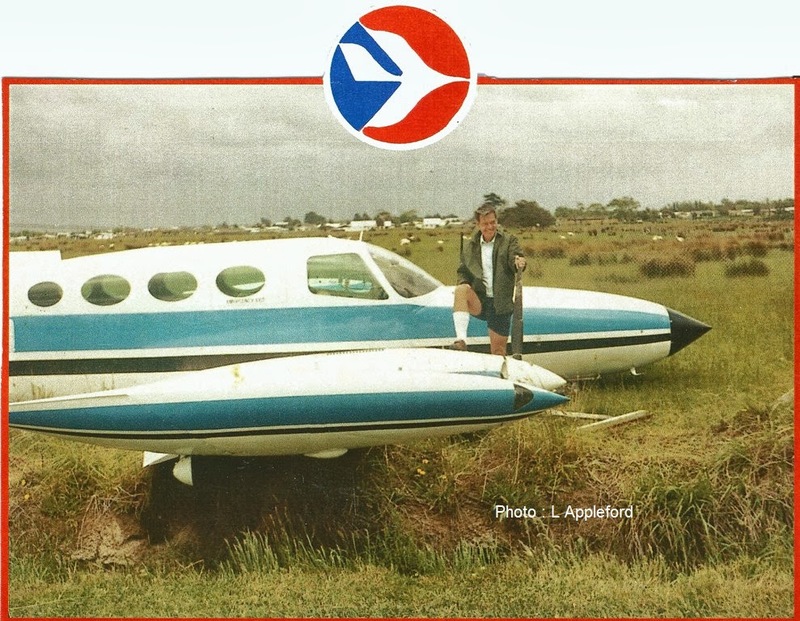 The arrival of ZK-DNQ enabled the company to introduce a Napier-Tauranga-Rotorua-Napier service. Tauranga received its first scheduled service on 7th of July 1980. 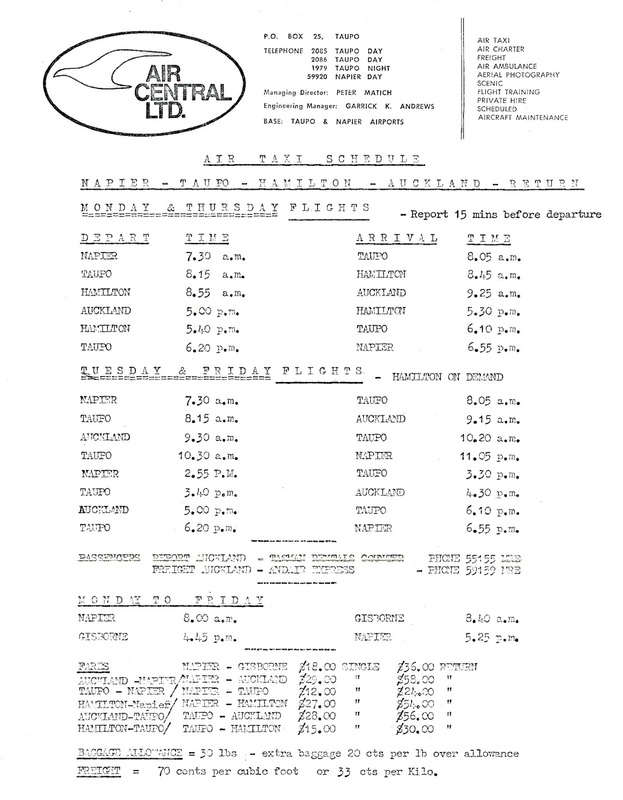 Flights between Palmerston North, Rotorua and Tauranga began in October 1980. In March 1981 the company’s remaining Cessna 337 ZK-DAQ, was destroyed in a hangar fire while on maintenance at Rotorua. In 1981 John Gardiner purchased the stake of the other three of Air Central’s shareholder before in turn selling half the company to Ron Connell’s company RCS International (1981) Ltd. By March 1981 this company had imported three Mitsubishi Mu2 aircraft which were demonstrated to a number of New Zealand third level airlines. In July 1981 Air Central began trialling a Mitsubishi Mu2G, ZK-EKZ. The Mu2s were high performance, pressurised turboprops with seating for 9 passengers. A fast aircraft on short sectors was not ideal and the company required a 70% load factor to break even. A second Mu2, ZK-EON was added to the fleet in September 1981 coinciding with takeover of Lakeair’s scheduled service and the extension of this to offer a twice daily Napier-Taupo-Auckland service on the 31st of August 1981. 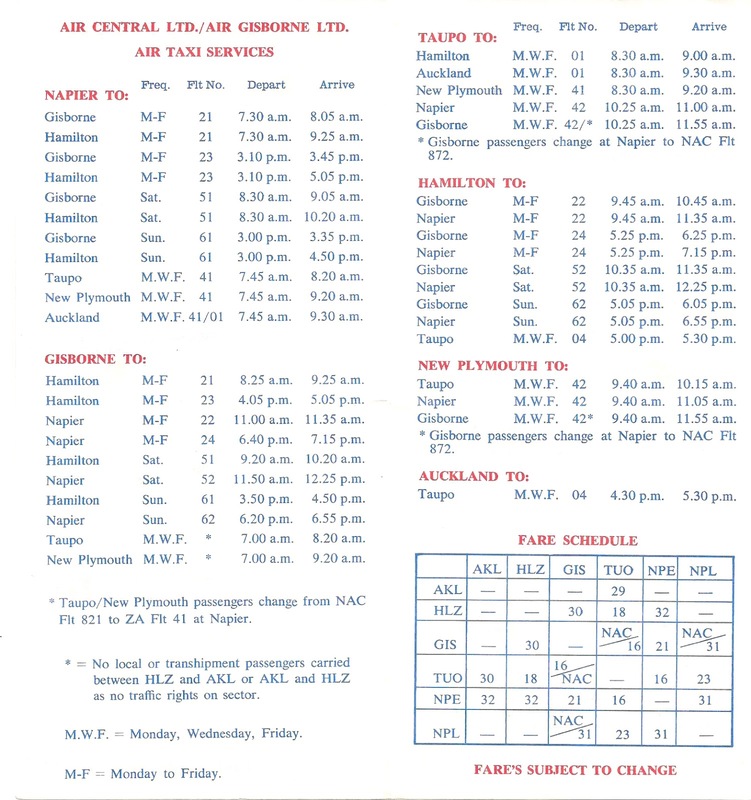 The most extensive of Air Central's timetables with extensive services stretching from Auckland to Palmerston North. 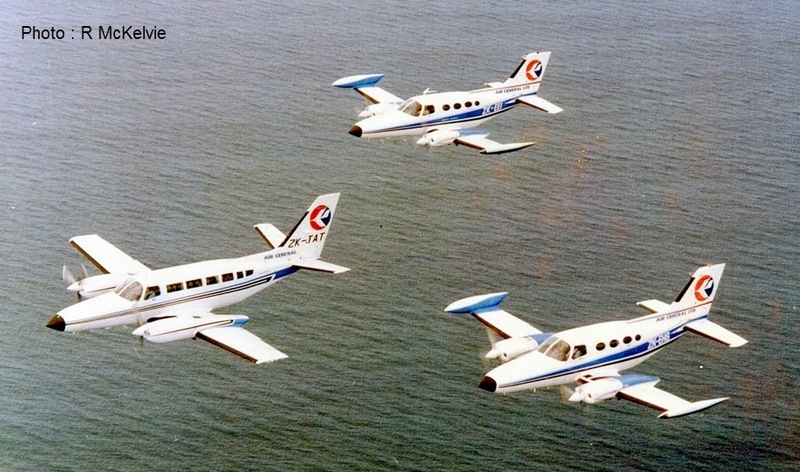 Mitsubishi Mu2Gs ZK-EKZ and ZK-EON were both on the ground at Tauranga at the same time on 25 November 1982. ZK-EKZ had two additional small windows towards the tail. 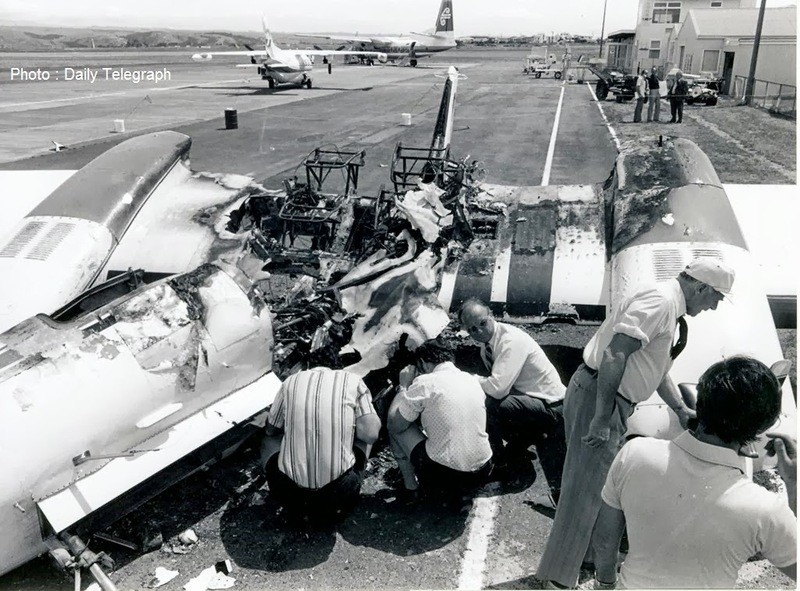 In late 1981 the company was looking forward to introducing its third Mu2, however, the company’s plans were shattered when the plane ditched north of Pago Pago with the loss of ferry pilot Bob Shewry on the 22nd of November 1981. Things went from bad to worse for the company. On the 8th of December 1981 Cessna 402 ZK-DNQ was lost after the aircraft was carrying out an emergency landing at Palmerston North. Landing on a short, wet grass runway with a nose wheel problem the aircraft over ran the runway before the undercarriage collapsed. The pilot and four passengers were unhurt but ZK-DNQ never got airborne again. A week later the company lost a second Cessna 402 when ZK-EEI caught fire while parked overnight at Napier. Due to the heat of the fire the cause was never determined. 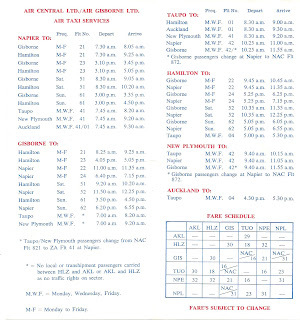 With a shortage of aircraft the Napier-Taupo-Auckland service ended on the 25th of January 1982. 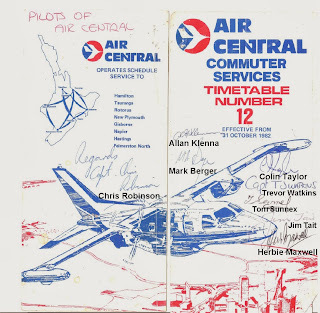 Rather than close Air Central down, in June 1982 NZI Finance took over Ron Connell’s shareholding before buying out John Gardiner but retaining him as the managing-director of the reformed Air Central (1982) Ltd. With the backing of the NZI Financial Corporation the company was restructured as Air Central (1982) Ltd. The new owners added a third Mitsubishi, ZK-ESM, to the fleet in October 1982. At the same time NZI wanted to put the airline on a more solid financial footing. It had expensive, high performance aircraft operating on short routes with lean passenger loadings. NZI’s solution came in the form of Eagle Air and it saw the acquisition of this company as a good move in consolidating their aviation interests. On 28 October 1982 Air Central doubled its flights to New Plymouth... John Gardiner, second from left, is seen with local businessmen. 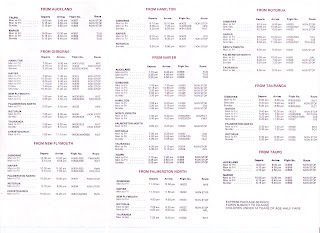 In June 1983 NZI Financial Corporation bought out Eagle Air and quickly moved to consolidate the two companies. In October 1983 the two companies were merged but in many ways it was an Eagle Air take over. The Air Central name disappeared, and the Napier base was closed. Use of the expensive Mitsubishis was restricted while Eagle Air looked to re-equip with three additional Piper Chieftains and another Embraer Bandeirante. The Mu2s were eventually sold and departed New Zealand in April 1984.